Clubs, diamonds, hearts, and spades are so ingrained in our culture, it seems as though they’re always been around. And it’s true – they have been around for a pretty long time, but they haven’t always looked the same. 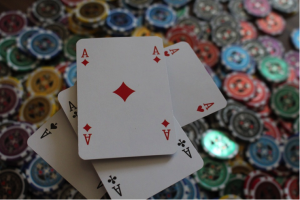 It’s thought that packs of playing cards originated in China during the Tang dynasty (618-907), and they were used to represent money. The four suits used during this time certainly had a common theme among them; they were, respectively: coins, strings of coins, myriads of strings, and tens of myriads. Some have speculated that the numerical value inherent in these suits is the reason why we use ‘ranked’ suits today. Eventually, the idea made its way to Egypt, and Italian merchants brought packs of cards from Egypt back to continental Europe (specifically Germany) in the 14th century. On those cards, money played less of a central role. The packs did feature coins, but the remaining three suits morphed into swords, batons, and cups. It wasn’t until about 100 years later that our four modern suits evolved, probably in France. But how on earth did we end up with these four rather disparate icons? And why red and black? Let’s delve into the dirty details. There’s little mystery as to how the spade suit evolved from the earlier set of four Italian suits. How can we tell? Well, the Italian word for ‘sword’ is…you guessed it…’spade’! 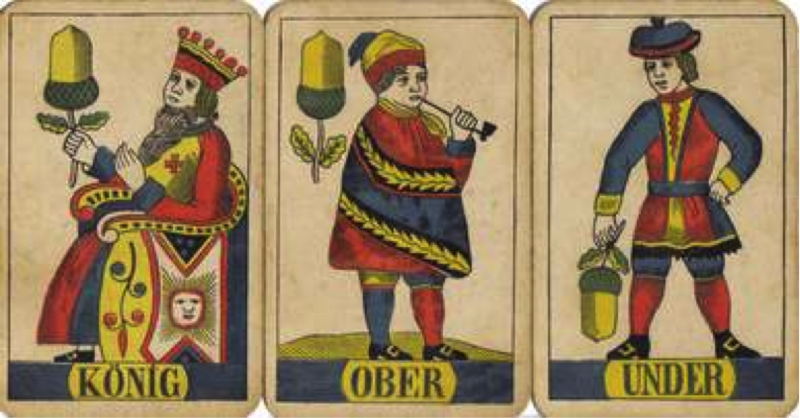 Just as spades are the highest suit in many games, some scholars and amateur historians believe that our four modern suits were created to represent different French societal classes. 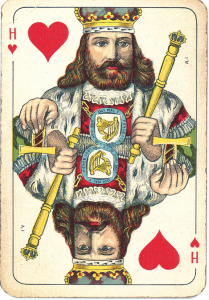 Spades represented the highest strata of the social sphere: the bold knights! It’s also thought to represent a leaf on the tree of life, as it were, as well as fall and winter (clubs also have this significance because of the suits’ dark hue). 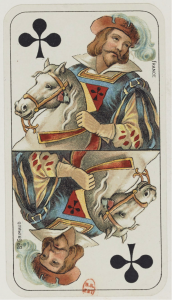 In Tarot cards, spades symbolize action, air, intellect, and death. How’s that for variety! According to the ‘social spheres’ theory of the four French suits, hearts were meant to represent the Church and all holy men. They are also, along with their like-coloured cousins the diamonds, thought to represent spring and summer – the ‘lighter’ seasons, if you will. In the Tarot, they represent love (of course), knowledge, fertility, and joy. Most people would be happy to have a heart appear in their card reading! Diamonds are believed to have represented archers and bowmen; their pointed shape may have been a symbol for an arrowhead. In Tarot cards, diamonds signify money, bravery, earthly matter, and energy. However, fortune tellers interpret diamonds as signifying annoyances or perturbations. Finally, in keeping with the other three suits, clubs also may have represented a fourth social class in 15th century France: shepherds and/or husbandmen. Their shape is thought to represent that of the clover, symbolizing agriculture and field work. Clubs are also sometimes referred to as trefoils – which any former Girl Guides will recognize as the Guiding symbol (featured on their delicious cookies). They’re thought to represent nighttime, fire, male energy, will and wealth, luck, and happiness. Okay, so now that we can understand where the four suits come, we’re still left wondering why our now-traditional decks of playing cards are red and black. Curiously, this doesn’t actually seem to be a widely-known piece of history. One rather pragmatic theory is that red and black inks were simply the cheapest to mass-produce; both could be made by mixing linseed oil with either soot (for black) or with cinnabar (for red). Whatever the reason, the two hues certainly contrast well!